Heat oven to 400 degrees. Line a baking sheet with parchment paper. In a medium-sized bowl, toss the cubed sweet potato with the coconut oil. Spread out on baking sheet and bake for 10 minutes. They should be soft, but not all the way cooked through. While sweet potatoes are in the oven, add cubed apples and chopped pecans (if using) to the medium-sized bowl. Once sweet potatoes are done, add them back into the bowl, too. Heat a small saucepan or skillet over medium heat. Add the ghee/butter and sage leaves. Watch carefully! The butter will begin to foam, then will start to brown. It will have a nutty aroma (kind of like ghee) — that's how you know it's done! This should only take a few minutes. Remove from heat as soon as it's done. 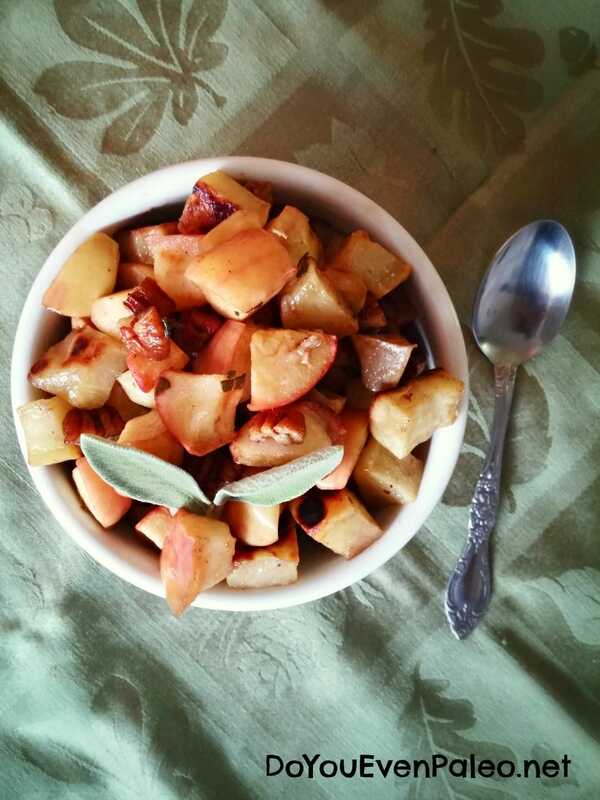 Pour browned butter sage sauce over the sweet potatoes and apples and toss to coat. Spread out on the baking sheet and return to the oven for 10 additional minutes. Serve warm!